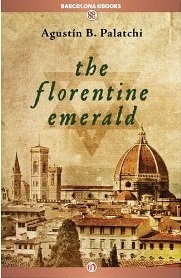 In this English-language translation of Agustín Bernaldo Palatchi‘s title, The Florentine Emerald (Barcelona eBooks), the historical setting of Florence in the time of the Medici’s rise to power and influence comes across on every page, with attention to detail down to the clothing, shopping, and even eating habits of the characters. With both a strong sense of historical accuracy as well as the intriguing “what if” that makes historical fiction so popular–such as the merchant’s son main character finding himself dining with Lorenzo de Medici when Leonardo da Vinci shows up as an invited guest–the book takes the reader on a thrilling journey through a time rich in both history, intrigue, and betrayal. When Mauricio flees Spain following the wrongful execution of his father for treason, he carries with him the secret that his ancestors were–until recently–Jews. He also carries the last possession his father could leave him from his tower cell, a stunning emerald with historic implications. Intent on following his father’s instructions of making his fortune by ridding himself of the jewel in Florence, a powerhouse of Europe at the time, Mauricio travels and finds himself in Lorenzo’s good graces by inadvertently thwarting an assassination attempt, bringing about a shift in power and influence for the de Medicis. The young Spaniard sets a different course in motion for himself when he meets Lorena Ginori, a striking young woman condemned to an arranged marriage to a disgusting and much older man. The only writing aspect that could have made this book more enjoyable would be a somewhat deeper explanation of the history, a difficult task considering that some readers will have picked up the book simply because of their interest in Florentine politics of the day and do not wish to be hand-held through Italian history. However, less knowledgeable readers who simply enjoy good historical fiction could possibly benefit from a little more explanation peppered throughout the book on the various characters who come into play. The Florentine Emerald is now available in English as an ebook from Amazon, Barnes and Noble, Kobo, and more.